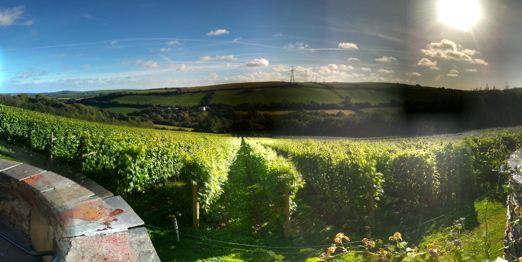 It’s mid-September and we’re sitting in glorious early evening Cornish sunshine tasting wine at the Camel Valley vineyards. It was supposed to reach 17 C in this part of the world today. According to winemaker and owner Bob Lindo, it reached 24 C, which must make him a happy man just a fortnight or so from harvest. Camel Valley is somewhere I’ve wanted to visit ever since I first sampled its Atlantic Dry some years ago. But we usually come to Cornwall in November and we always stay near Land’s End, which is almost at the other end of the county. But here we were a month or so earlier, and able to join one of the Wednesday evening tours and tastings. The tour itself is pretty brief and accommodates quite a large crowd with all different levels of wine knowledge. So you’re not going to get up close and personal or be able to dive deep into his winemaking techniques, for fear of holding up others who want to get down to the wine tasting. There’s a couple on our tour who’ve been coming for years and not, I’m guessing, to hear how the wine is made. Bob keeps the spiel pretty simple, but covers all the bases in a highly personable and humorous manner. We learn that he used to be an RAF pilot and then became a sheep farmer. The sheep sheds are now where the wine is made. Bob tells us how the 22-year-old Camel Valley vineyards cover 23 kms and, in a good year, produce around 80 tonnes of grapes for wine. Like other English winemakers, yields are kept low to get the best expression of terroir (not the words that Bob actually uses – he saves that piece of jargon for the tasting). 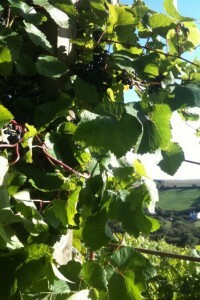 The vines have a good leaf covering on their Atlantic-facing sides to protect them from gales. Someone asks why there are roses at the end of the rows of Seyval Blanc vines we’re standing by. Bob’s eyes light up as he reveals that, on a “retirement” global tour of vineyards, he asked the same question “out of devilment” to see what answers he would get. He was given a whole host of theories, his favourite being a guy in Sonoma who told him it was so that the horses (presumably which once carried the picked grapes) knew where to turn when they were going up and down the rows of vines. Bob’s opinion? They look nice, simple as that. We’re given a quick tour around the sheep sheds, where we learn how he and his winemaker son Sam are big believers in chilling the must to zero degrees during the fermentation process, and using warm disgorgement when making their sparkling wines. We even get a demo of the riddling machines. Then Bob can’t hold back any more about all the awards Camel Valley has recently won, the two most prestigious being the IWC (International Wine Challenge) trophy for best sparkling rosé in the world, which includes Champagne, and a UK winemaker of the year award for Bob’s son Sam. 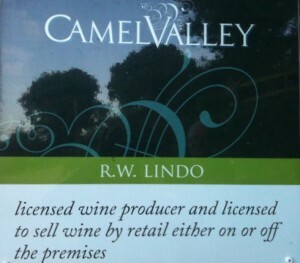 Fortnum’s are among those now stocking some of Camel Valley’s wines. We then all head to the terrace of the visitors’ building for the wine tasting. 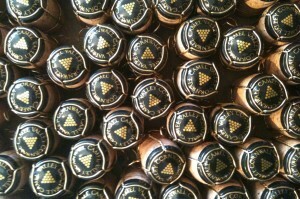 We’re each handed a glass of the 2008 Camel Valley Brut as we head outside. It’s a vibrant sparkler, full of apples, white currants and rosehips. We then race our way through the award-winning 2008 Camel Valley Pinot Noir Rosé Brut, a wonderful mixture of strawberries, spice and blossom; the award-winning 2009 Rosé, which was like diving into punnets of raspberries; and the soft, smoky cherries-and-dried-herbs 2009 Red – pleasant, but a bit of a poor relation compared to the fizz and the whites. Bob also asks us to taste two different types of their (award-winning) Bacchus wine and vote on which we liked best. Both are made from the same grape, a Sylvaner, Riesling and Müller-Thurgau cross. One is made according to the flavour he and Sam wanted to achieve and one is made as a true expression of terroir. First we tried the 2009 Bacchus Dry, which has quite an intense but fresh smell and taste of gooseberries and elderflowers, and could easily rival good Loire Sauvignons. Then we sampled the 2009 Darnibole Bacchus, whose grapes were grown on a small parcel of land with a slate subsoil. And boy, can you taste that lovely slate! Purely from personal taste, I preferred the plain Bacchus by a whisker as it seemed a little more aromatic. We put it to the vote. Interestingly, slightly more women to men preferred the Bacchus Dry and slightly more men preferred the Darnibole, although Mr. SipSwoosh was with me on this. Despite all the awards and recognition, Camel Valley has still managed to retain the feel of a mom and pop operation, which is part of its charm. I’m not simply referring to the family involvement in the company, but to its strategy for the future. At one point, Bob is asked if there are plans to expand as a result of this new popularity. The answer is no, they’re fine as they are. He also divulges their no-fuss strategy. If it was successful the year before, then they’ll repeat it the year after. Whatever they’re doing at Camel Valley, it seems to be working.